- The contents on this page are subject to change or delete without notice. What's ¨ImageMixer™ 3 Mac Edition¨ ? 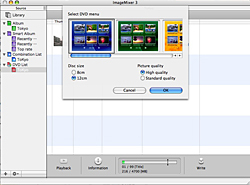 ¨ImageMixer™ 3 Mac Edition¨ is a software for creating DVD-Video discs with the original contents by importing the videos to Mac. 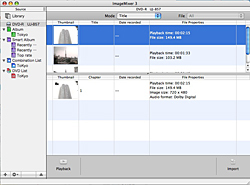 With ¨ImageMixer™ 3 Mac Edition¨, creating DVD titles can never be difficult. Play back the titles on a supported DVD player and enjoy watching the titles with everyone ! ¨ImageMixer™3 Mac Edition¨ supports ¨Dolby Digital 5.1ch¨. Just connect a camcorder to Mac to browse the contents. Preview videos on a disc directly from the camcorder. Cut out videos by specifying IN point and OUT point. To create a DVD-Video, just Drag & Drop the video files. DVD creation with Easy operation ! With ¨ImageMixer™ 3 Mac Edition¨, Drag & Drop the video files to the [DVD List] and click the [Write] button. Dolby and the double-D symbol are registered trademarks of Dolby Laboratories.